I wrote an Apple //e emulator to run my family's old Apple ][ disks. The source is on Github. It builds on MacOS and Linux and supports disk emulation, speaker audio, text mode, lores graphics, hires graphics, gamepads-to-paddle emulation, and VBLANK probing and video mode per-line capturing sufficient to almost run Vince Weaver's Split Screen Demo. All video modes are supported through GL shaders. Disk images can be dragged-and-dropped onto the disk drives! I worked on the Alice 4 handheld computer with other members of the Alice Group. This battery-powered device uses a dual-core ARM CPU and an FPGA to run old SGI graphics demos interactively including tilt and touchscreen. I worked on the Alice 3 CP/M retrocomputer with other members of the Alice Group. An ARM Cortex M4 serves I/O requests, a Propeller serves VGA, and a Z80 runs CP/M 2.2. Here's the GitHub repo for a simple interactive GLFW sample that draws a polyhedron with trackball manipulation. Check out the ray-tracer in a WebGL fragment shader that I wrote based on a ray-tracer I wrote in 1987 in C on an Amiga 500. A long time ago, a bunch of friends and I ported BSD UNIX to the Mac II. We called it "MacBSD". Our code formed the basis for the mac68k port of NetBSD. In my spare time many years ago (1999? ), I built a tristripping API called ACTC, which is being used by Lawrence Livermore in a visualization system and by Digital Anvil in game authoring tools, among other projects. Before that, I wrote a less flexible tristripping API called Meshifier, used by Ubisoft to create models for their game Ultimate Golf; ACTC fixes several problems in Meshifier and provides a better API. Lawrence Kesteloot and I worked for many years on a Z80 homebrew computer that we called the Alice II. We created some web pages documenting our adventures. 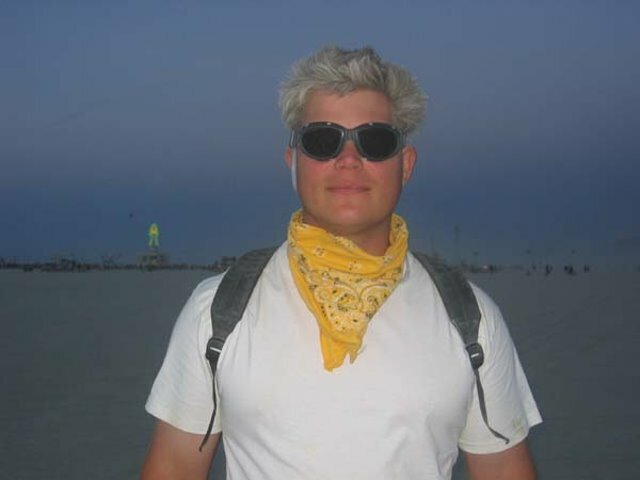 At Burning Man 2006 through 2013, I camped with the Karma Chickens. I played drums in 2012 for Suicide Poodles, a classic rock cover band. In 2005, with my friends and colleagues David Shreiner and Alan Commike, I filed patent 7,460,126, describing a multithreaded, multipipe media player. The implementation was capable of playing a uncompressed "quad HD" movie (3840 by 2160 pixels) directly from a RAID array of fiber channel SCSI disks. (The target was the Sony SXRD 4K digital projector, which had four inputs, one for each quadrant.) It was a pretty large chunk of code using OpenGL, OpenML, pthreads, and C++. I was kind of proud of the code; it was my first large-scale threaded application. It ran under IRIX 6 and the SGI version of Linux that ran on Itanium. It was, however, not user-friendly and required a pair of full-height racks of equipment. If I remember correctly, Sony declined to work with us after we provided a single demonstration of the technology streaming a short film. A few years later, Sony demonstrated the same projector with a "media block" which was essentially a PC streaming JPEG2000 compressed images to the projector. I appeared briefly in the movie "Revolution OS" playing Richard Stallman's "Open Software Song" with "The Gnu Stallmans". Because of that, I have an entry on IMDB, the Internet Movie Database . Back in college, my friend Lawrence and I competed with each other to write the shortest program that would ray-trace shaded spheres and provide an ASCII art image of the result. He made a web page describing our competition. The programs are very ugly and illustrate some things you may not know can be done in the C programming language. I joined Dave Shreiner in courses at SIGGRAPH 2002, 2003, and 2004 on "Performance OpenGL". I presented part of and wrote part of the course notes for the SIGGRAPH '97, '98, '99, and '00 full day course called Advanced Graphics Programming Techniques with OpenGL, and also the SIGGRAPH '99 Lighting and Shading Techniques for Interactive Applications course. You can send mail to grantham@plunk.org.